May is Bike Everywhere Month, and Friday, May 18 is Bike Everywhere Day! If your morning commute takes you past Log Boom Park in Kenmore (or you’re looking to add a few more miles to your morning route – see #2), stop by our Park’s booth and say hi. We’ll have coffee, pastries, swag, maps and more for early risers from 6-9 a.m.
Add biking to your daily commute – Not already biking to work? Try adding a short bike ride to catch your bus, or bike instead of driving to the carpool or park and ride. Take the path less travelled – Got a good ride that you’re doing regularly? Give yourself the time to add a little detour on a new route. Sometimes you can avoid a particularly hilly area by taking a flatter, longer route, and add miles the easy way! Solve the last mile – Bike shares seem to be everywhere, and for good reason. Check out the different options while linking that last mile to the pub, the store, or go further for your lunch with a bike share ride. Most of them are $1 for a half hour. Get motivated with peer pressure – Join one of Washington Bike’s Bike Everywhere Challenge teams! Go to Live to Ride and sign up. Find a team in your company or area. Go out and explore – We have over 300 miles of regional trails, paved multi-use paths, throughout King County. 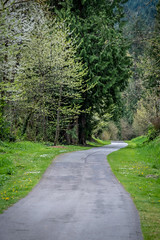 Get a copy of King County Park’s Regional Trails Map at any local King County or Seattle Public Library, or use our TrailFinder website to plan a trip. Get out and explore Your Big Backyard! Previous Post GiveBIG to the KC Parks Foundation!